Then and now: Why summer camp is more important than ever - Times Publishing Newspapers, Inc.
For thousands of years we made friends organically until about 15 years ago, when we began meeting people through social media and video game headsets. We used to play outside – now neighborhoods look like outdoor ghost towns. Most of the children are inside, staring at glowing screens. As a human race, we are losing social/relationship skills, because we aren’t using them with much frequency. At an NFL tailgate party, one of the last bastions of old-school socializing, a 10-year-old boy begged his parents for his iPad, then proceeded to sit in the car playing games on it. Not his fault – his parents’ enabled the behavior. Eight- to 18-year-olds consume an average of over seven hours of screen media per day, often while multi-tasking, a statistic that has increased in the past 10 years. Excessive screen time is linked to emotional and behavior problems, and difficulty with peers and school. A multi-year study of 50,000 high schoolers led by noted author/researcher Jean Twenge, showed that the happiest kids use screens less than an hour per day, and teens who spend more time in face-to-face interaction with friends are happiest. There is an inverse relationship between happiness and time spent on screens for children. How and where can we distract kids from their screens while giving them the best opportunity to grow into good people and contributing members of society? Traditional, outdoor, hot, sweaty, buggy, muddy Summer Camp. Camp is the antidote to the traps of modern society: in-person interactions, collaborating in groups, and navigating the ups and downs of relationships. It’s also a place where kind, caring people teach life skills like making friendships, integrity, self-regulation and independence. At my Camp, electronics are forbidden. At first kids (and staff) may complain, but in the end they thank us. In the 25 years I’ve been running summer camps, I’ve seen the pendulum swinging back to a sense of normalcy with today’s parents. The new generation is more concerned about gaining new experiences and being good people – two things that good Camps specialize in. Summer Camp is more important now than ever, filling the societal gap left by institutionalized schools, busy parents and glowing screens! 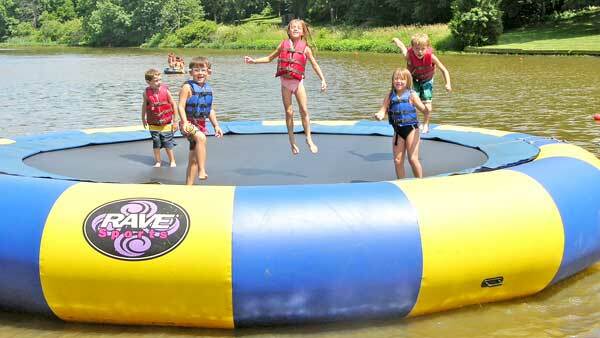 PHOTO CAP: Kids cooling off on Liberty Lake Day Camp’s huge trampoline, on 60 shady acres in Bordentown, NJ.